Latest news and events can be found on our Facebook page. 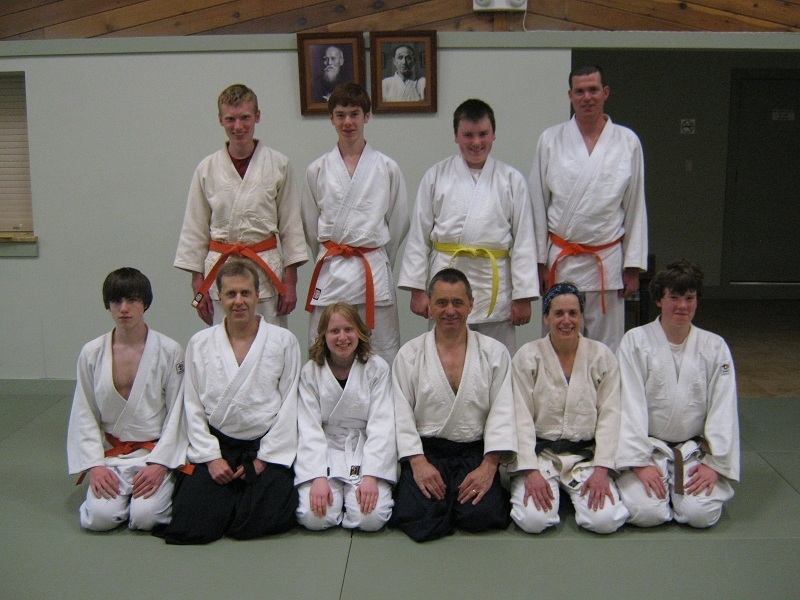 It's hard to believe our dojo was founded 15 years ago. We celebrated with a day of training with friends from other dojos. 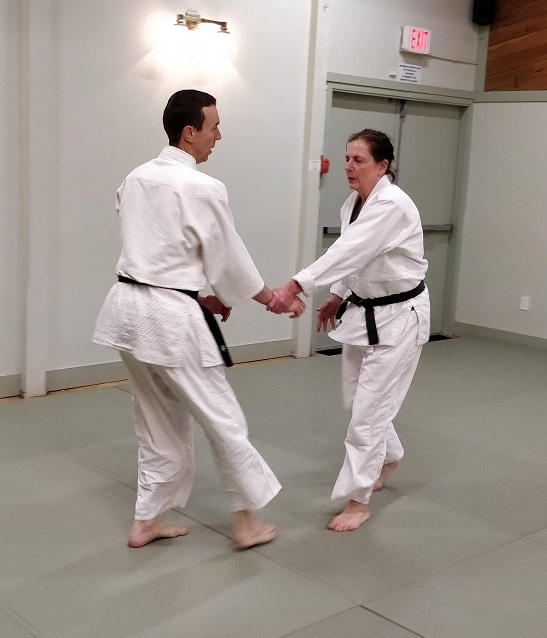 Judith taught us some techniques starting from tai sabaki (body movement, evasions), then Jim led a session on kokyu nage (breath throws). 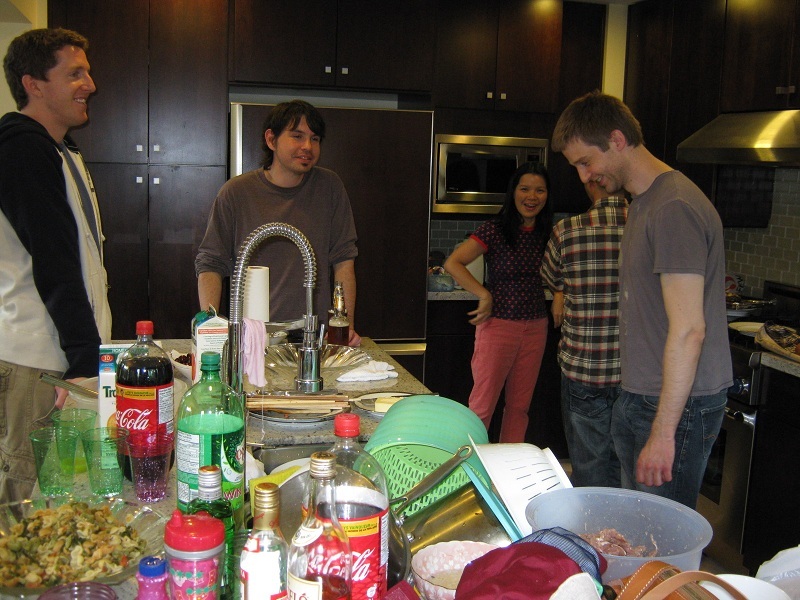 Andrew, Tim and Tin visited from Vancouver and Patrick came down from up-island to join a good group from our own dojo. Technique details are here: Kenshu Feb2019. We had another full day training in a kenshu (deep study) session. 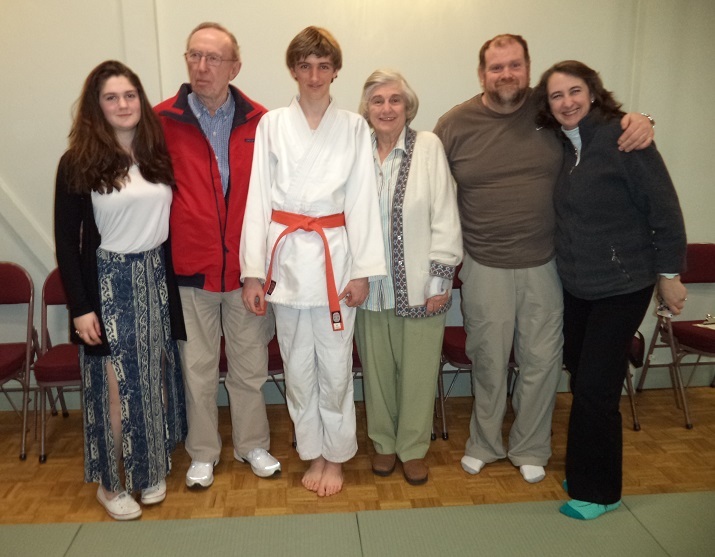 We hosted Andrew McBride and other visitors from Vancouver for a special focus on Ushirowaza (behind) techniques taught by Jim, and Katate Ayamochi (cross-wrist grab) techniques by Judith. Can't wait until the next session! Technique details are here: Kenshu Oct2017. 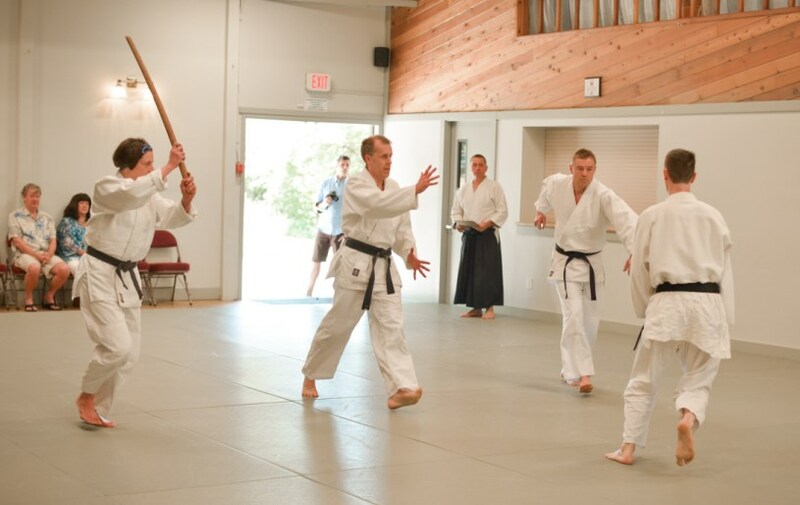 This summer we were privileged to have a visit from our head of school (Soke) and some of his students from Tokyo. 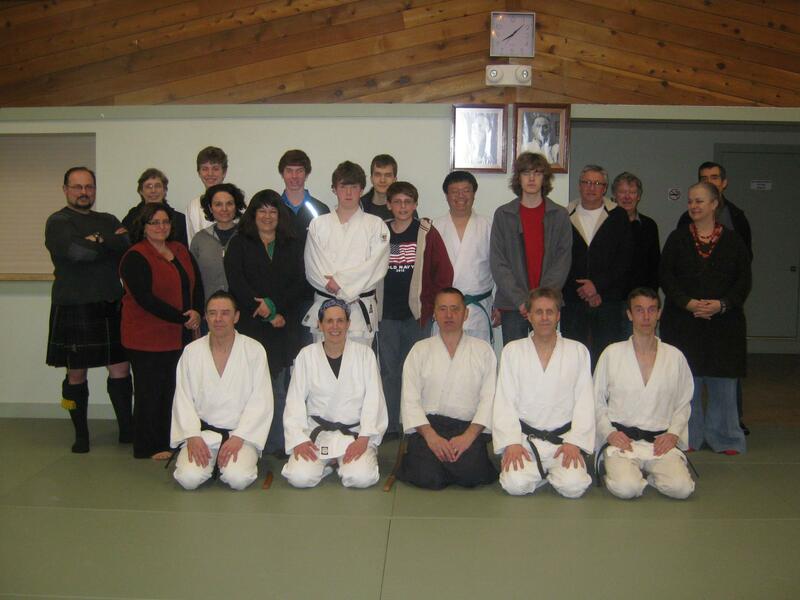 The visit was organized by Keith Taylor, who ran a session in Maple Ridge attended by several members of our dojo. 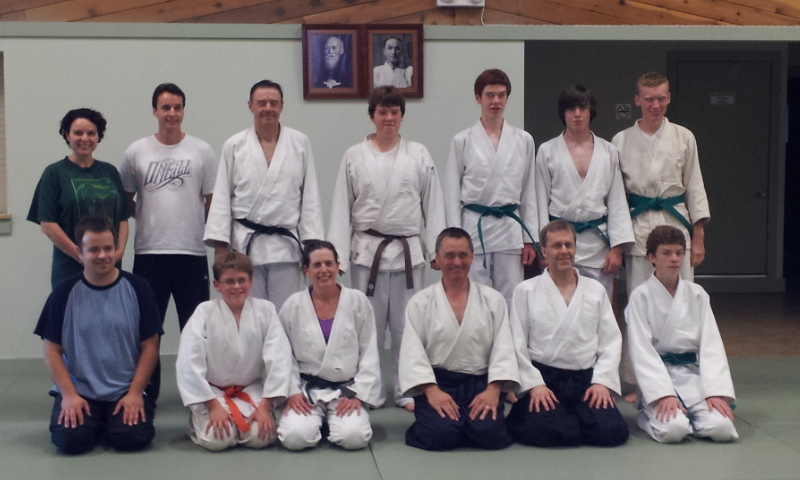 Our own dojo also welcomed the visiting party for two days. Entertainments during the time on the Island included visiting the Sidney Aquarium, Butchart Gardens for high tea, and attending the Hiroshima/Nagasaki memorial event in Esquimault. Read about all of the details on Facebook. 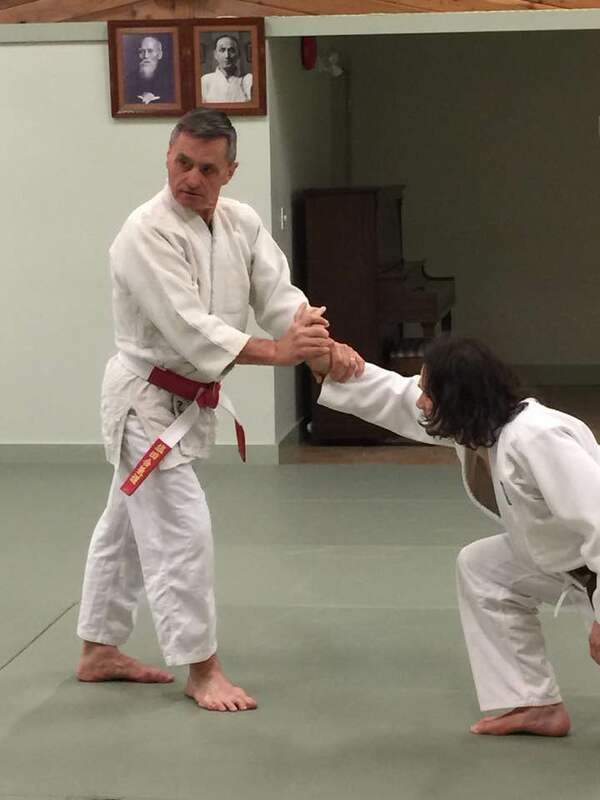 Our regular twice-yearly session was graced with a fabulous lesson on how to apply kamae (basic stance) within techniques, taught by our very own Fred Haynes. See the full photo montage on our Facebook page. Details of other teaching can be found here: Kenshu Jun2017. He worked towards it for two years and finally we found a time when fitness, health and preparation came together and it happened. Congratulations Randy! 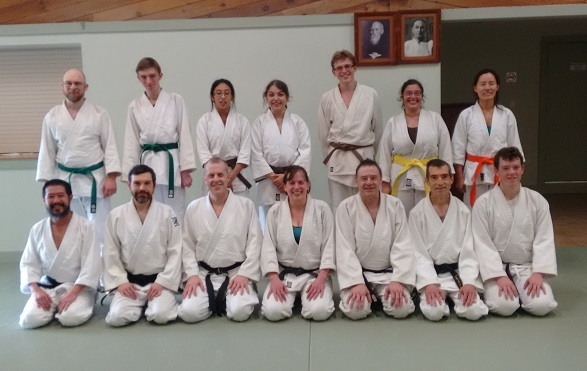 Thankfully the recent storms abated and the ferries were running smoothly, so we were able to enjoy another great day's training with Vancouver and Maple Ridge aikido clubs. 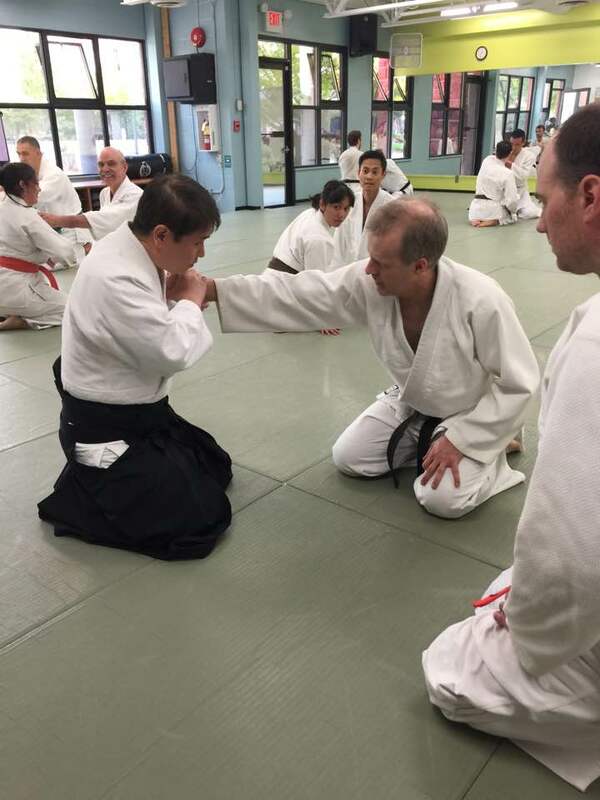 Our theme was Kokyu Nage (breath throws) and connecting to Uke, with all the Island Aikido instructors leading parts of the day. Details of the teaching can be found here: Kenshu Oct2016. 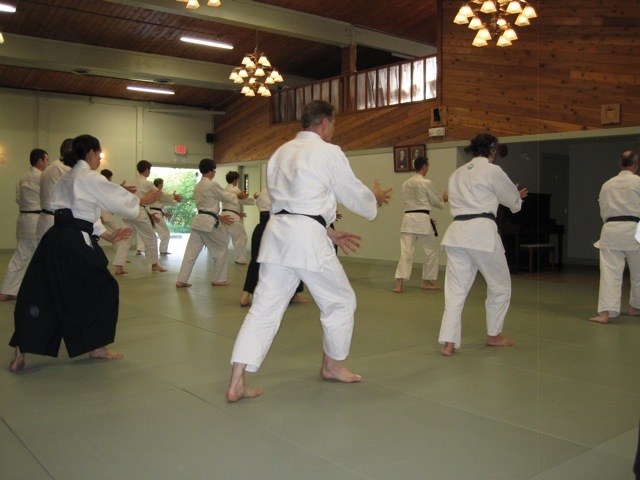 Several times per year, our club gets together with members of Vancouver and Maple Ridge aikido clubs for combined training. 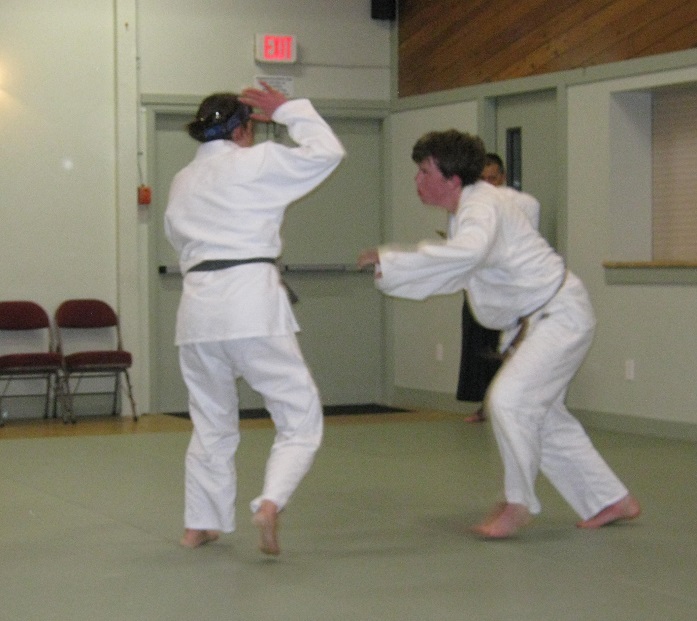 The Japanese term kenshu means "in-depth study" and refers to training at an advanced level. While originally conceived with a focus on senior students, recently we have encouraged all grades to attend, with great success. Our May get-together was the largest yet, with 22 students attending including 11 visitors from the mainland. The theme was "Learning how techniques can go wrong". 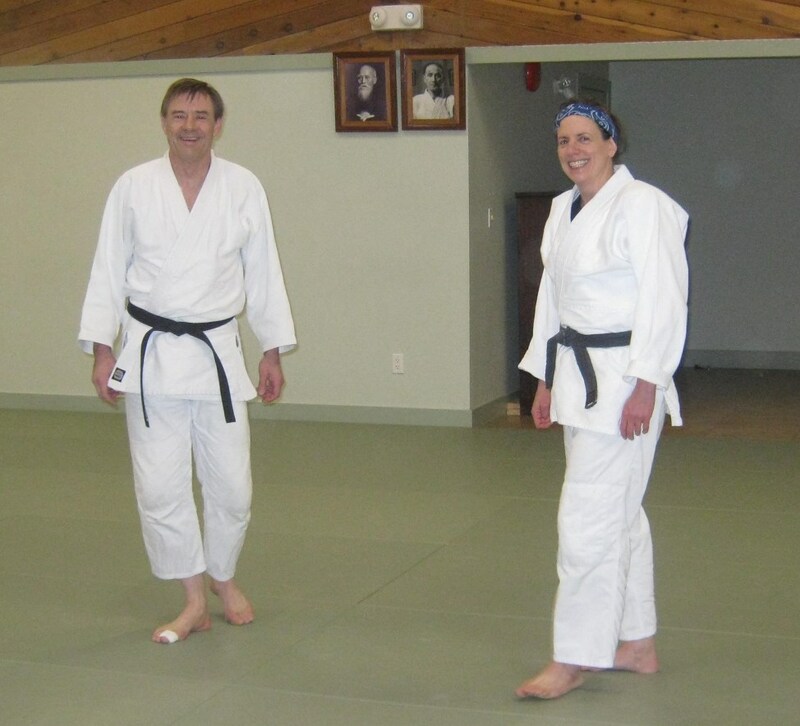 Judith and Jim combined to teach Kaeshiwaza (counter techniques) and Henkawaza (changing techniques). 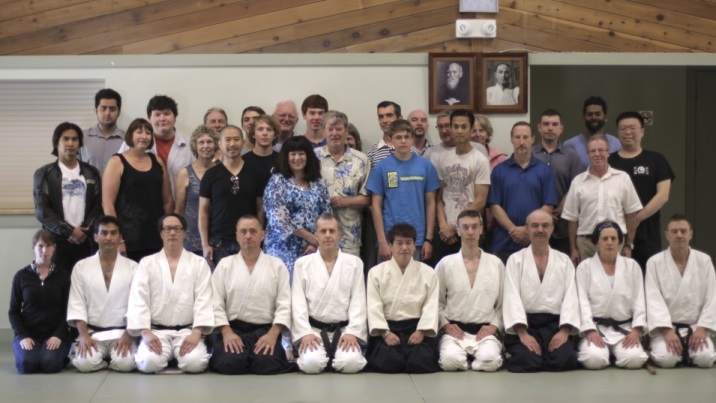 Full details of what was taught can be found here: Kenshu May2016 - Teaching Plan. 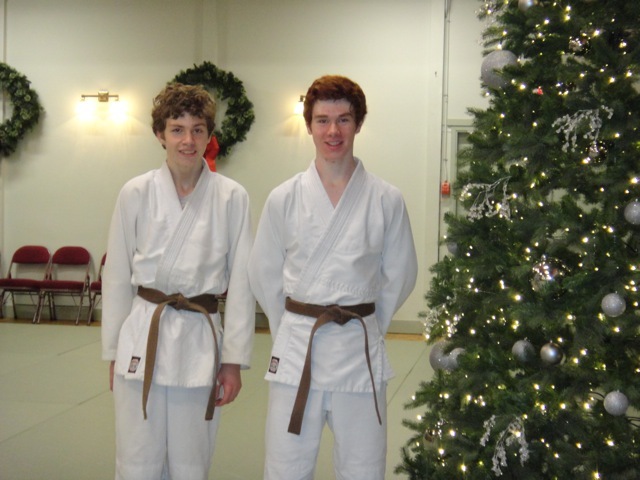 With decorations all around the dojo, Daniel and Sam completed tests just before Christmas and were graded up to 5th Kyu and 3rd Kyu respectively. Thanks to Brian and Stuart for acting as ukes. And thank you to both candidates for giving everyone else an early Christmas present with your confident technique execution and excellent spirit. 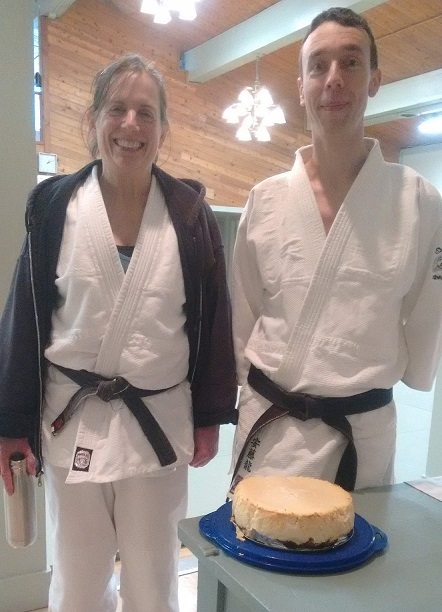 Jonas and Dillon worked hard at preparing for their 6th Kyu test through the Fall and were graded up at the beginning of December. Congratulations to both of them. 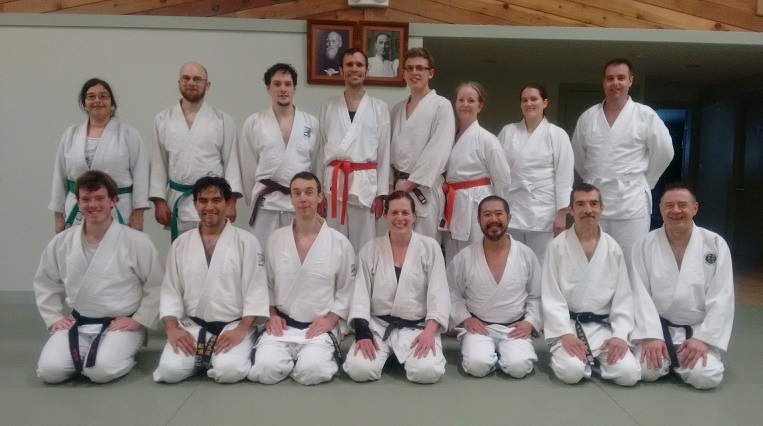 Andrew McBride and several others from the Vancouver Dojo visited us for a full day of kenshu training. 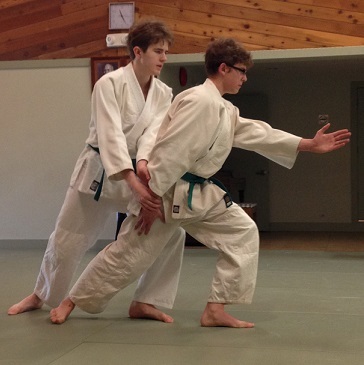 The theme was "the back foot", focussing on techniques that require a pivoting step back, a pivot on the back foot, and a couple of moves into a weight-back stance. Great training for everyone. 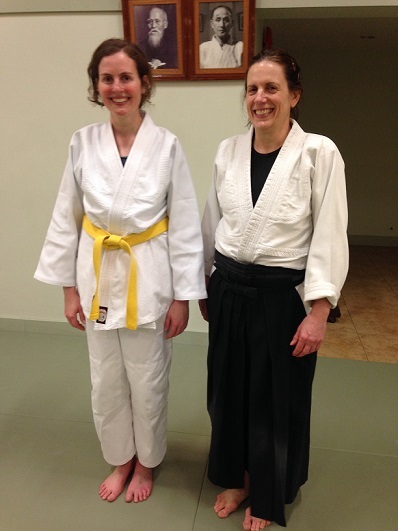 Congratulations to Kathryn for completing her yellow belt grading. After several extended absences due to work commitments, she set a new record for the time taken to graduate from the beginner course! 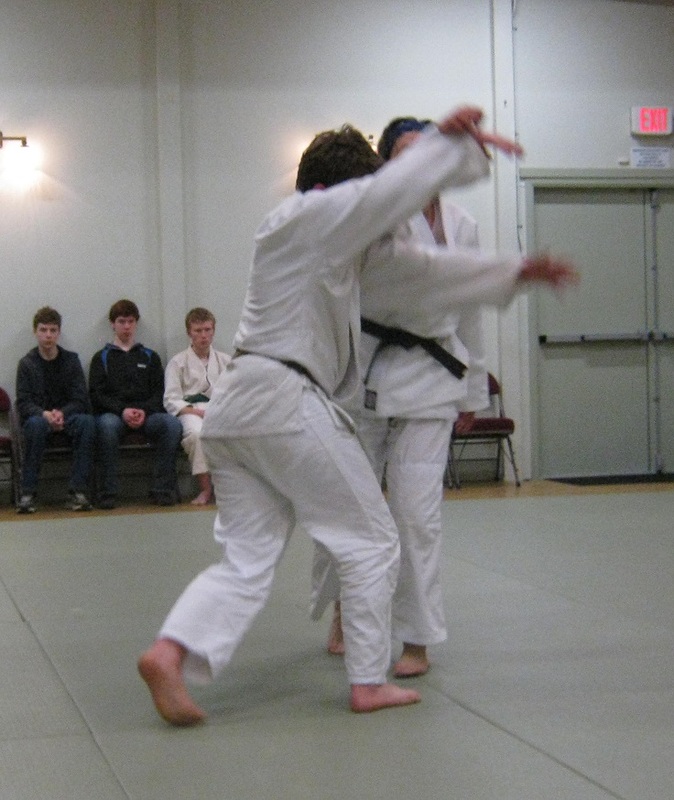 Sam and Simon successfully completed an energetic and stylish test and were both awarded the rank of 4th Kyu. Our non-profit society is now one year old. 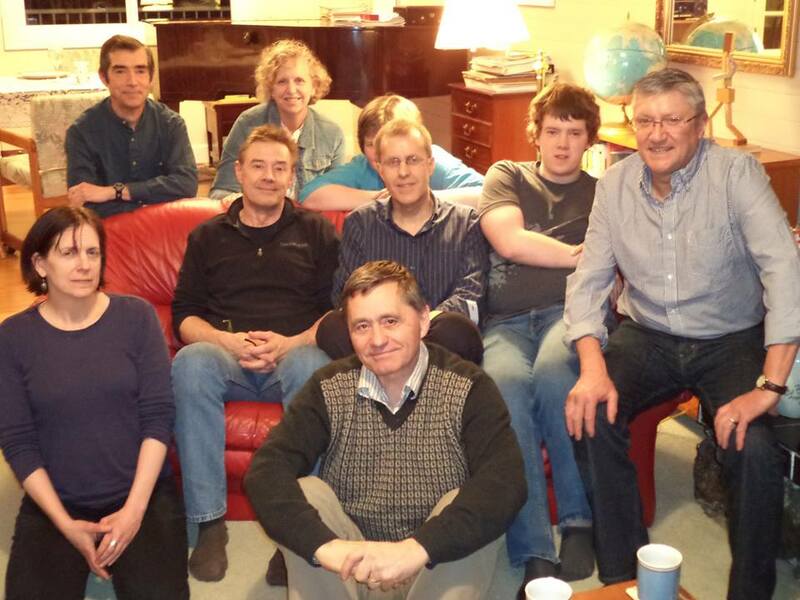 We held our first Annual General Meeting over dinner at Jim's house. Other than a barbecuing error that almost resulted in the salmon going up in flames, it was a great evening..
Congratulations to Daniel Davenport on your latest achievement. And well done for bringing so many family members to support you … surely a new record. 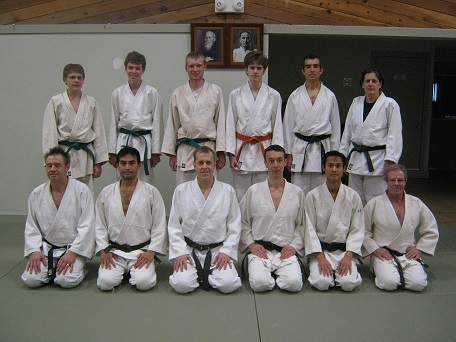 Brian and a group of Aikido yudansha from Vancouver travelled to Japan to participate in a series of Aikido classes presented by Sonoda sensei (Yoshin Yobu gasshuku). The group stayed with Sonoda sensei in an apartment on the outskirts of Tokyo and took part in a number of events including a visit to the Naguri onsen (see photo). 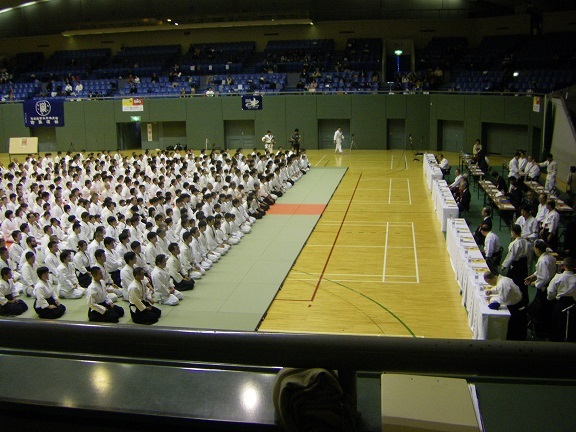 The group also participated in the 59th All-Japan Yoshinkan Aikido Demonstration (embukaitai) held in the Komazawa Olympic Park Gymnasium (see photo). 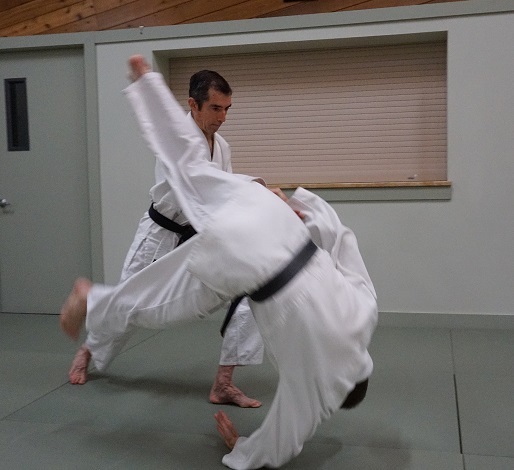 Island Aikido has established a relationship with Panorama Recreation Centre to offer aikido courses to people living on the Saanich Peninsula and elsewhere in Greater Victoria. Initially we are offering an adaptation of our regular beginner's course on Tuesday evenings from mid September through November. Registration is through the Panorama website or in person at the facility near Sidney. In the new year, we plan to expand the listing in the Panorama Active Living brochure to include continuing classes. Here's hoping that this is the start of a long and mutually beneficial relationship. 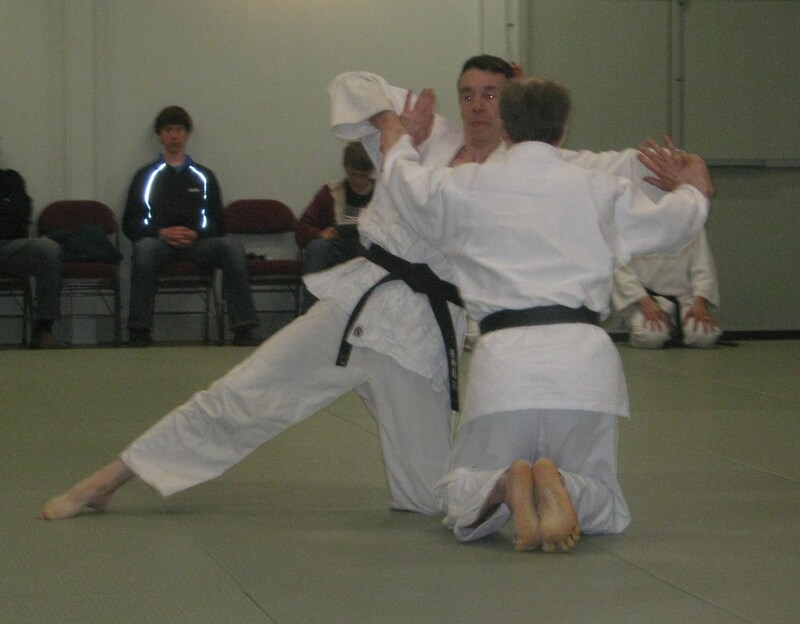 Brian Leckie has over 10 years experience in Aikido, having started out as a beginner with our club. 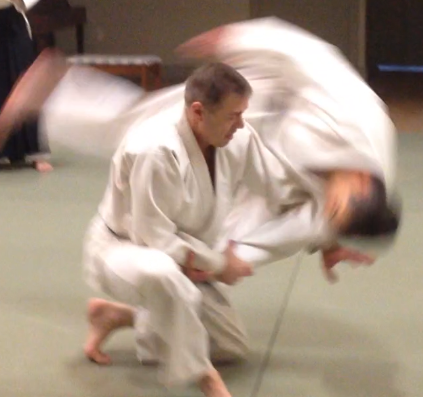 So it was a great pleasure to see him grade to 2nd Dan, and to do so with great style and finesse. Thanks to Randy for being Brian's uke for the test. 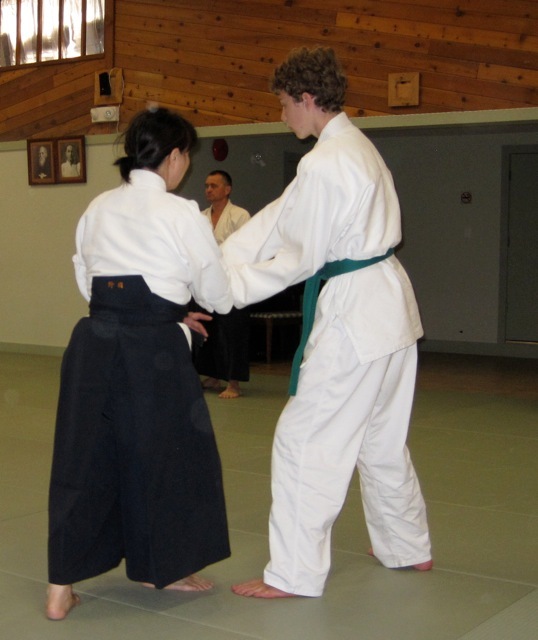 (a) To provide instruction in aikido to people living on Vancouver Island. and others in Canada and overseas. 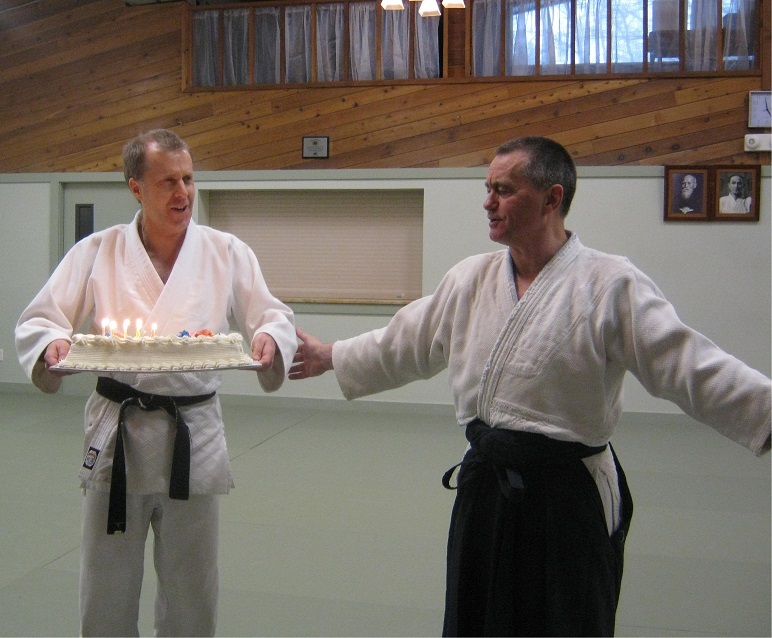 Island Aikido has just passed one of its greatest milestones - we've made it ten years! We sent off the last decade with a bang, inviting many of our friends from the Vancouver and Maple Ridge clubs to join for an all-day training session. 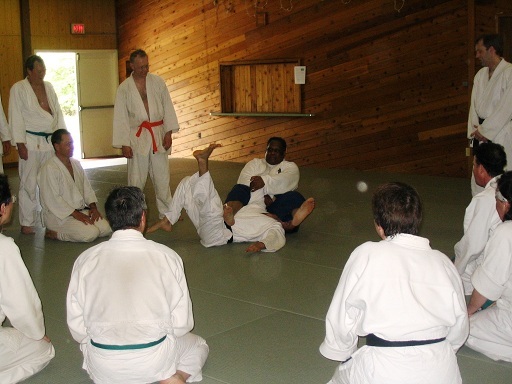 Classes were taught by Greg Pun, Andrew McBride, Jim Kightley, and finally Fred Haynes Shihan himself. We ended the day with a rousing 'Happy Birthday' to the club. Let's keep going strong for another 10! 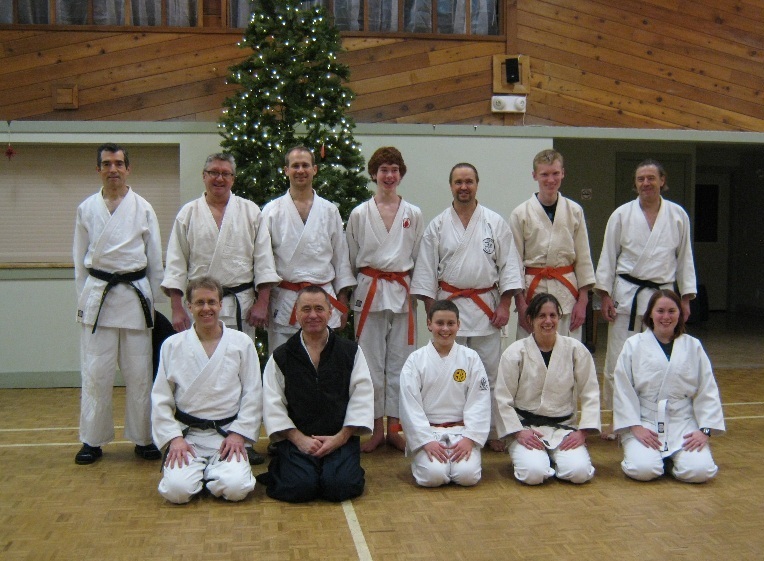 On the 30th of January, our very own Mario Sonier graded for his Ikkyu rank. 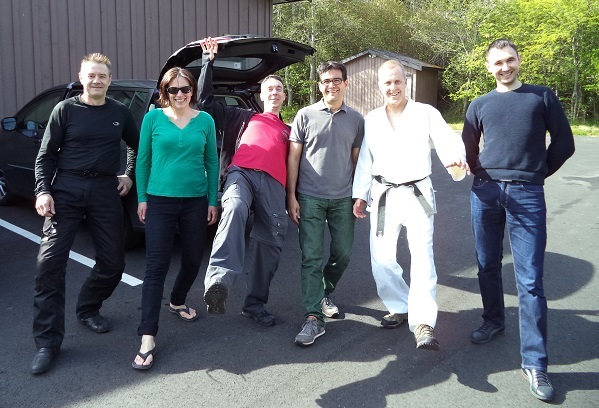 With Stuart Scrimger as his uke, Mario impressed the instructors, and is now well on his way to black belt. Congratulations on your success, Mario! 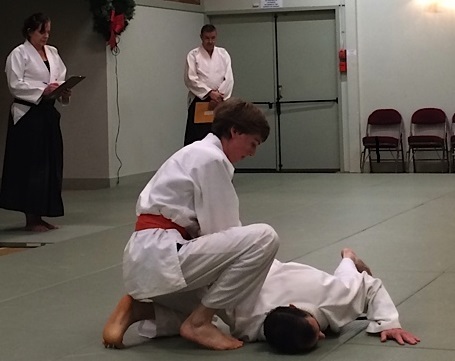 Getting done just in time for Christmas, Andrew Birch and Henry Parsons have graded for Sankyu. It's been a long time coming, but the extra training made itself apparent for their test. 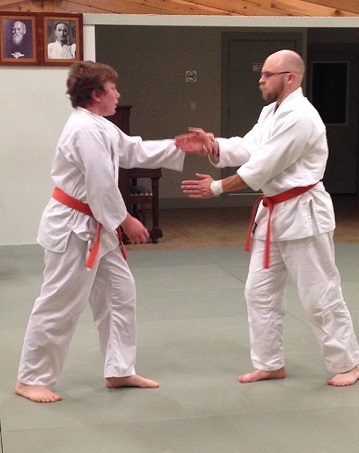 Looking forward to seeing those brown belts in the new year! 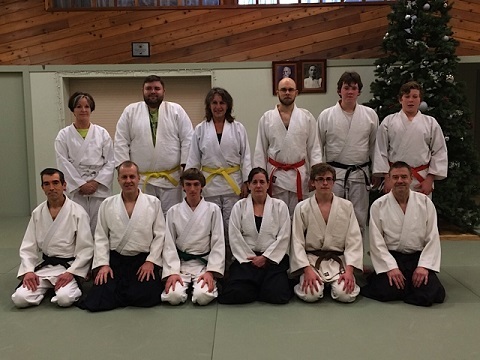 We have welcomed members of the Vancouver and Maple Ridge clubs to our dojo on several occasions in the past year for kenshu (deep study) training. 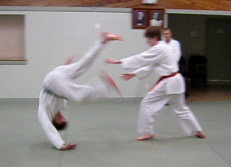 This month's session focussed on jiyu waza (freestyle) practice. 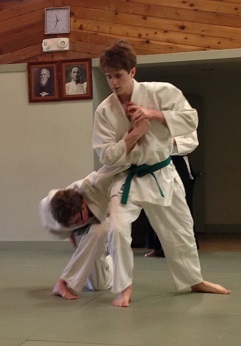 Tim Barr from Vancouver showed great spirit as he prepared for his imminent Shodan grading. 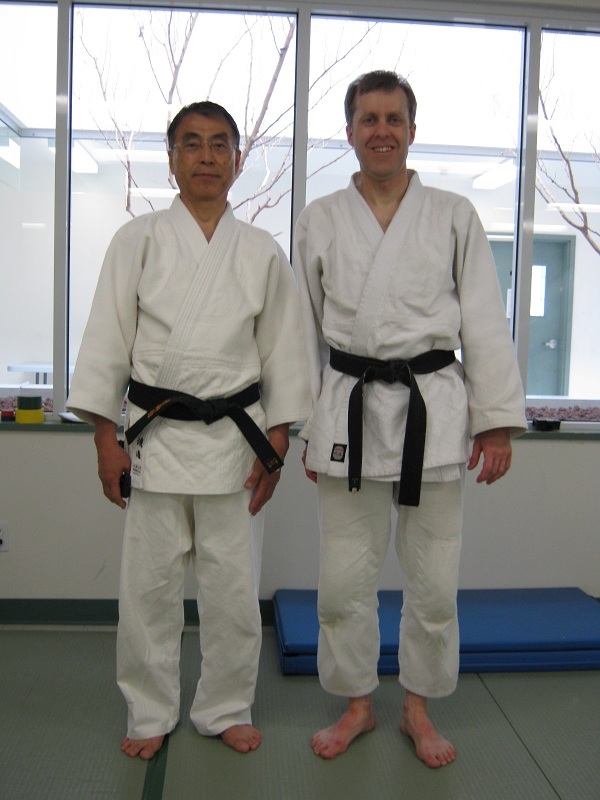 Watanabe Sensei (8th Dan) is an instructor in Tokyo and a long-time friend of the Vancouver and Victoria dojos. 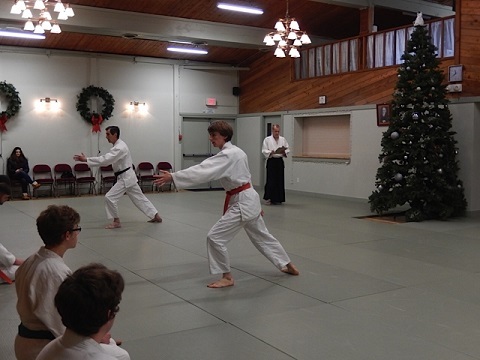 Several of our club members were delighted to be able to attend seminar sessions in Maple Ridge and Vancouver. 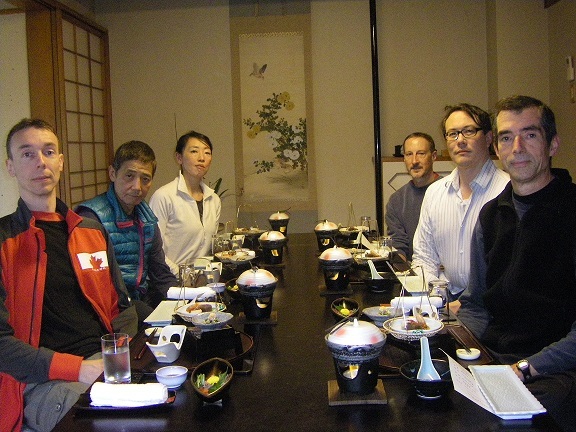 We also had a chance to chat with Sensei over dinner at Khai Phan's house afterwards. Photos from the event are available here courtesy of the Vancouver club. Our club now has its own Facebook page. 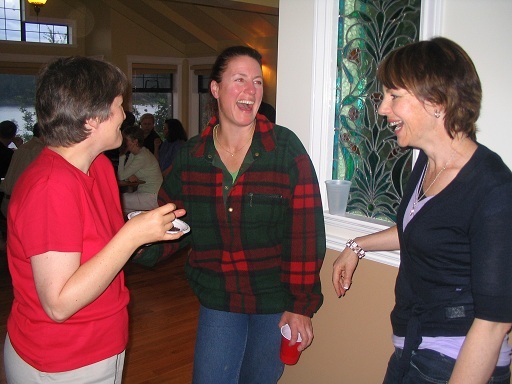 Email Judith if you have something you wish to share with clubmates and visitors, or just post a comment directly. 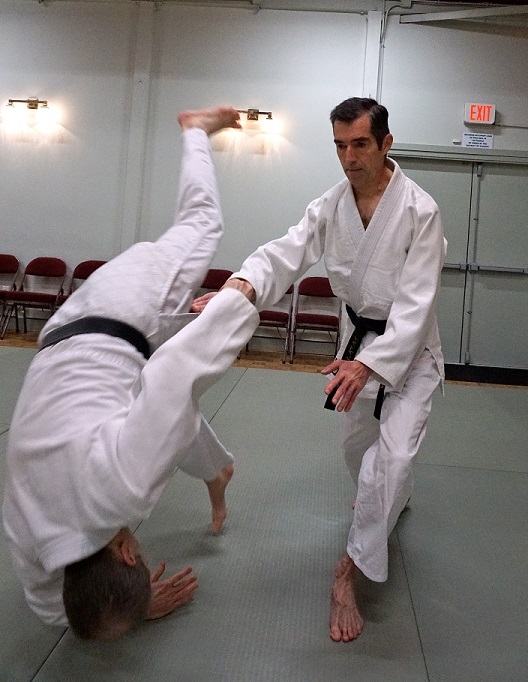 Fred Haynes Sensei officiated and our club played host for Andrew McBride to test for his GoDan (5th degree) black belt. 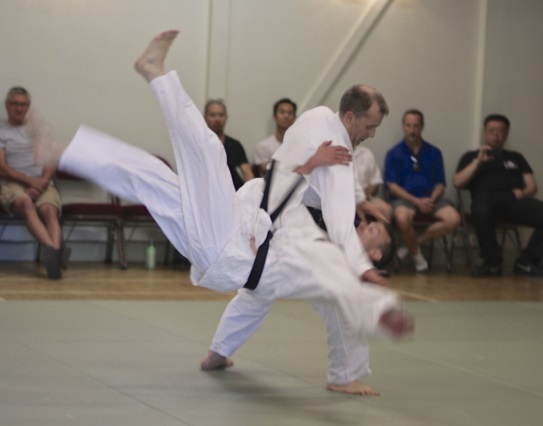 Andrew is a long-time friend of our club and an instructor at the Sowakan Dojo, Vancouver. 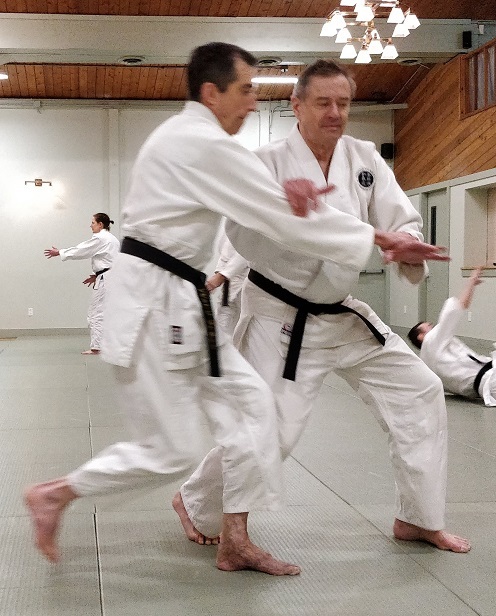 The test was timed to coincide with a visit to Victoria by Yasuhisa Shioda, 8th Dan instructor and son of the late founder of the Yoshinkan school of aikido, Gozo Shioda. 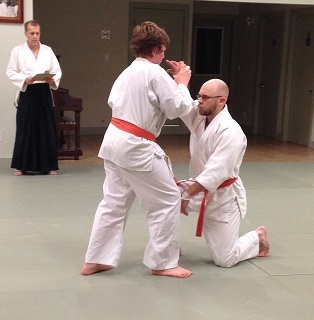 Our honoured guest holds the title "Soke", which means the head of the family, providing continuity with the founder. 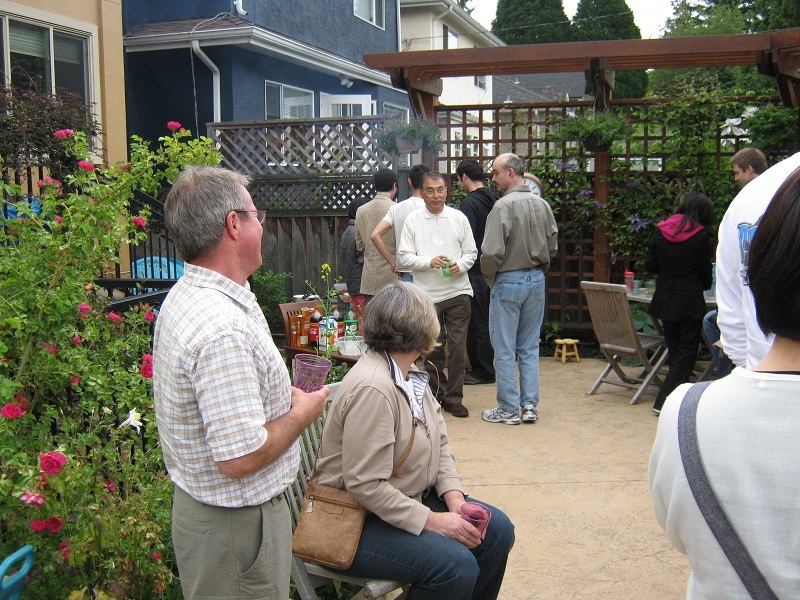 Check out the wonderful Flickr photo album compiled by members of the Vancouver club, showing the Godan test and barbecue at Fred's house, as well as other recent events. 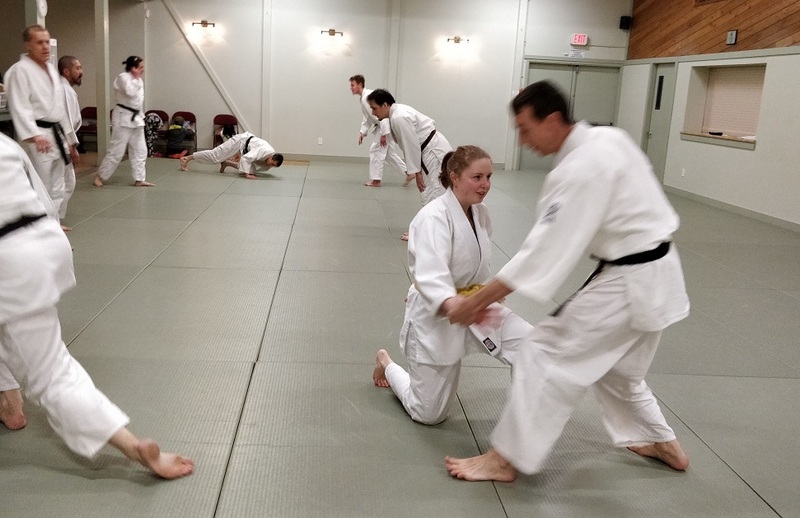 Several of the club's senior students worked hard through about six months of focused preparation for their next black belt grading. 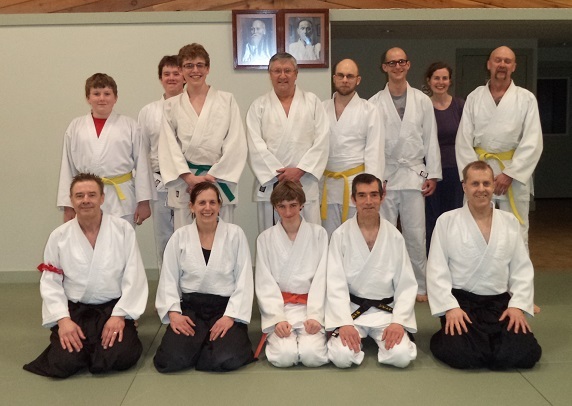 The tests took place on 28th March under the watchful eye of senior instructor, Fred Haynes, and with many friends and former students in attendance. 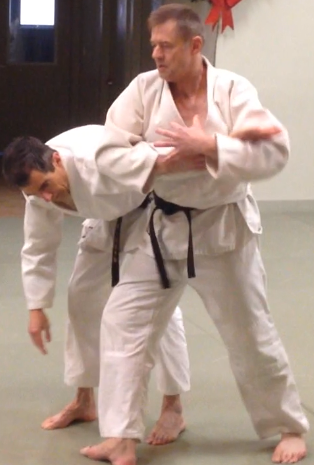 First Judith Berman tested for 4th Dan, in partnership with Randy Feuerriegel who was testing for 2nd Dan. 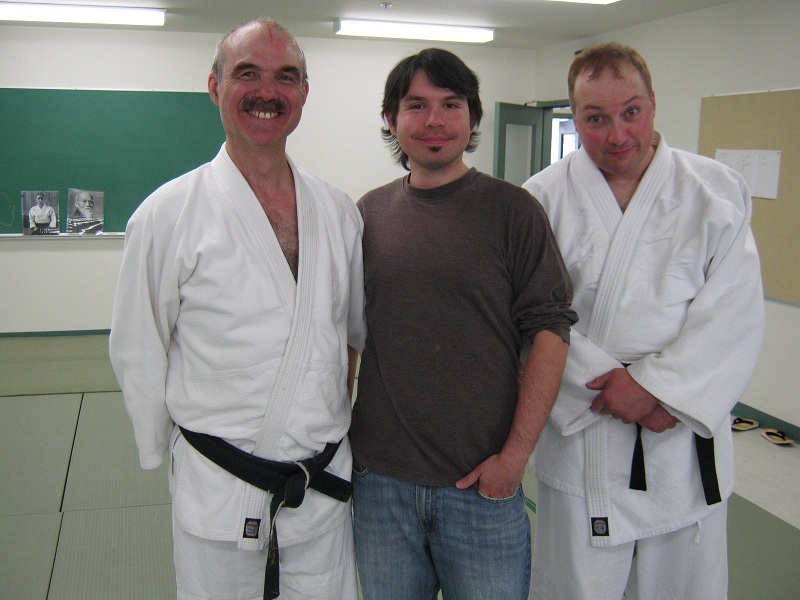 Then immediately following, Jim Kightley took his 5th Dan test, partnered by visiting instructor and friend from Vancouver, Andrew McBride. All candidates were successful and were awarded their respective higher grades. 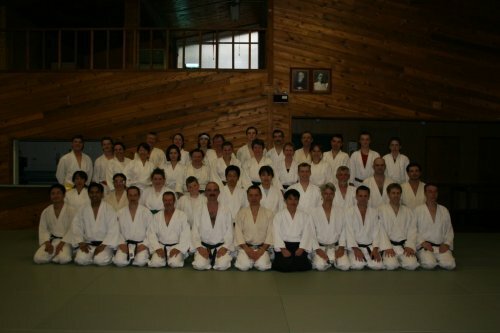 Furthermore, Haynes Sensei granted each of those who tested an instructor's licence corresponding to their higher ranking. 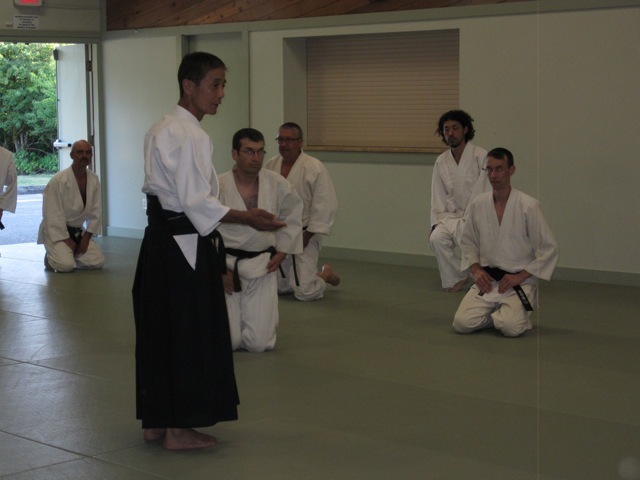 According to general Yoshinkan practice, instructors are allowed to award grade-level certificates to other students at two ranks below their own rank. Stuart Scrimger was present at the founding of our club, attending our Open House startup event as an 8-year-old way back in 2004. 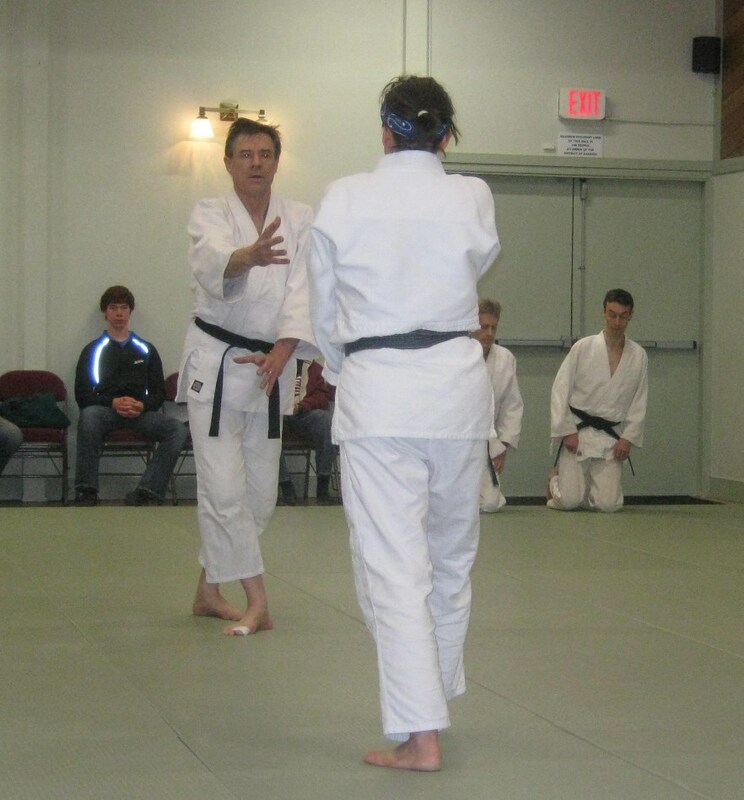 So it was a special pleasure to see him join the black belt ranks in February 2013 after many years of diligent training. He set a high standard in his technique presentation and has a very natural and fluid style to his jiyu waza (freestyle). The organization of the test was not without its challenges. It was supposed to take place on one of our regular club nights, which happened to coincide with Valentine's Day. But we were told at short notice - the day before - that the Hall was booked for a special party that night, so we made rapid plans to defer to the Friday night. We still had a good turnout of spectators and supports, including Stuart's parents, who were hours away from leaving on a Mexican vacation! 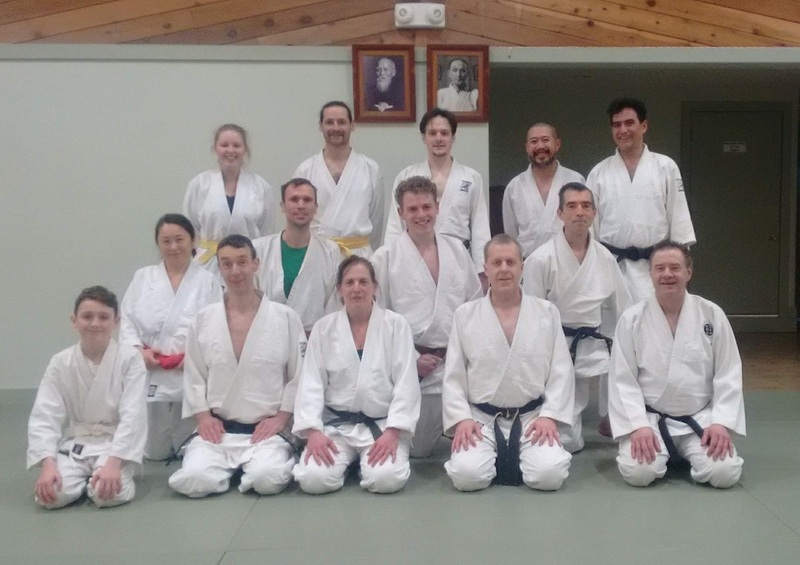 Our club was delighted to host Sonoda Sensei, a top-ranking instructor from the Hombu (headquarters) and Sayamashi Dojo in Tokyo. 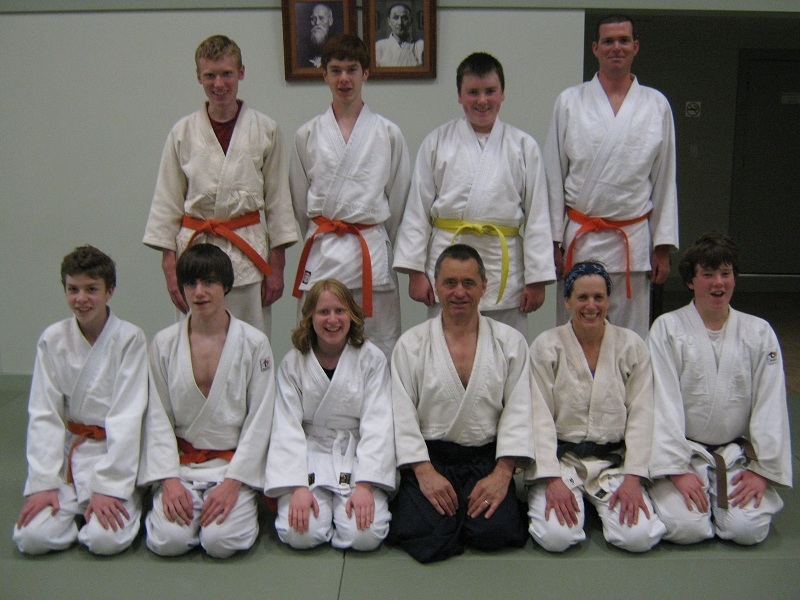 He was accompanied by four of his students who were vacationing and training in Aikido while in B.C. 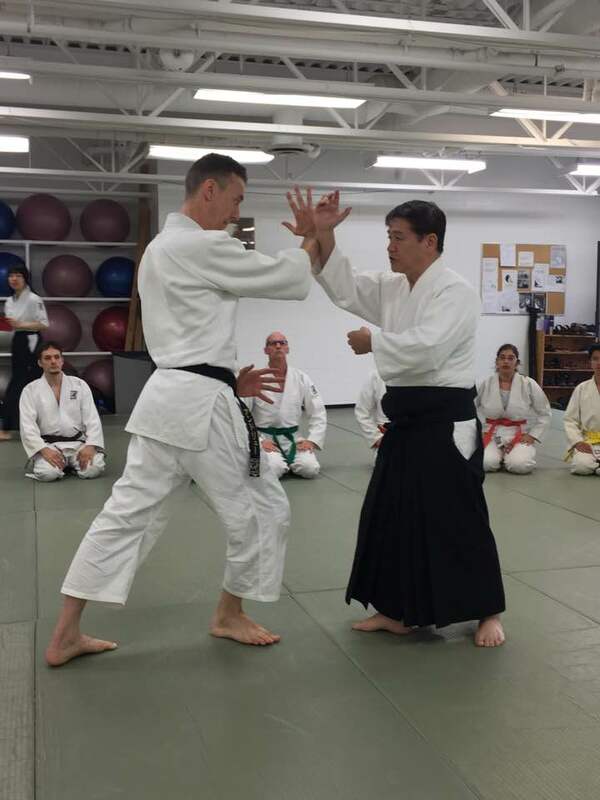 The trip was organized by Greg Pun and other instructors from the Vancouver area, who accompanied the Japanese party and trained with us. 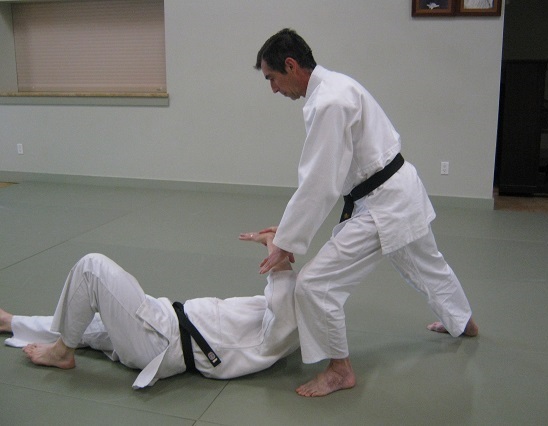 Sonoda Sensei taught an interesting sequence of moves comparing sword and open-hand attacks. He focussed in particular on defences to a double-handed grab attack, morote-moche, i.e. two of uke's hands grab one of shite's arms. The day after the seminar was devoted to sightseeing in Victoria, visiting Mount Tolmie, the Empress Hotel, Royal BC Museum lobby, the inner harbour causeway and Fisherman's Wharf (reached via water taxi). 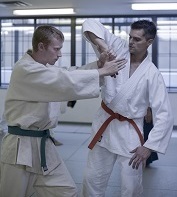 Four students - Andrew Birch, Luke Haynes, Alexander Macaloney, Henry Parsons - achieved the necessary standard in grading tests and were awarded the rank of 5th Kyu in July 2012. 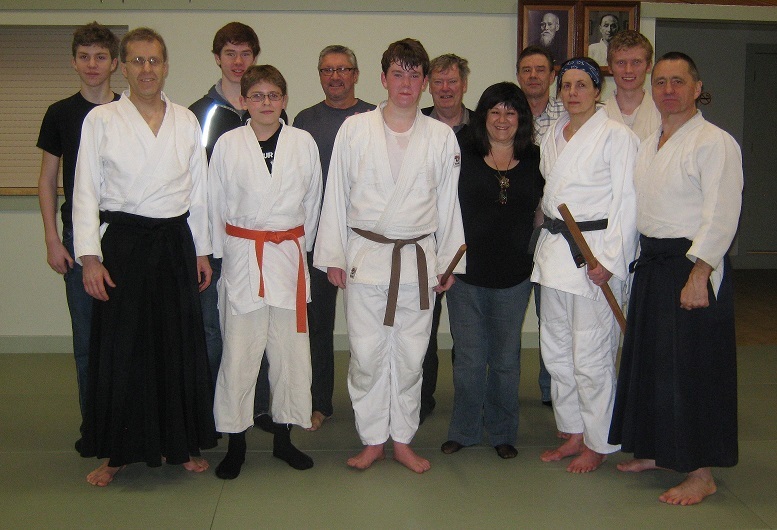 The club says farewell to Anna Lena Diehl, who was visiting the Saanich Peninsula during April and May 2012. 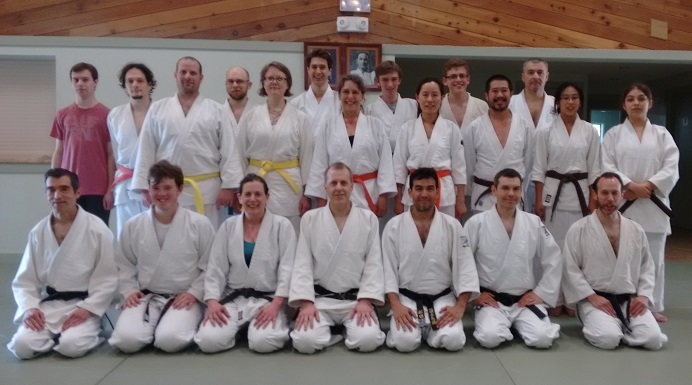 A group of club members travelled to Vancouver for a weekend of clinics taught by Watanabe Sensei, who was on a week-long visit from Japan. Many thanks to our hosts for organizing the visit and for their excellent hospitality. Shioda Kanchou arrived in Victoria on Thursday, June 7, with seven Japanese students and several Canadians from Ontario. On Friday they spent the day relaxing at Fred Haynes' waterfront home and sightseeing. 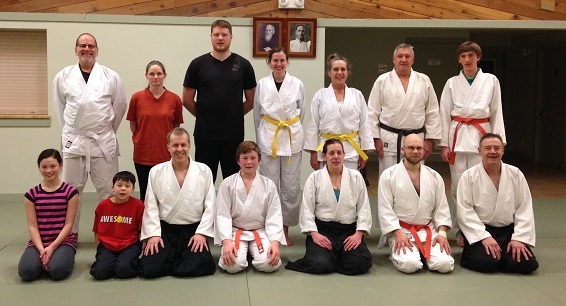 Training at Shinbukan Dojo started on Friday evening, with about 40 people including some from Ontario, and some with Keith Taylor from the Vancouver and Maple Ridge clubs. 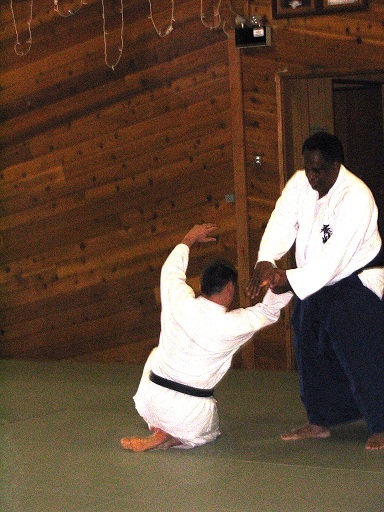 Shioda Kanchou emphasized a pivoting movement to receive a front strike, making sure to maintain kamae and one's centre as one changes direction. Training continued on Saturday morning. Shioda Kanchou focused on the finer points of some basic techniques. 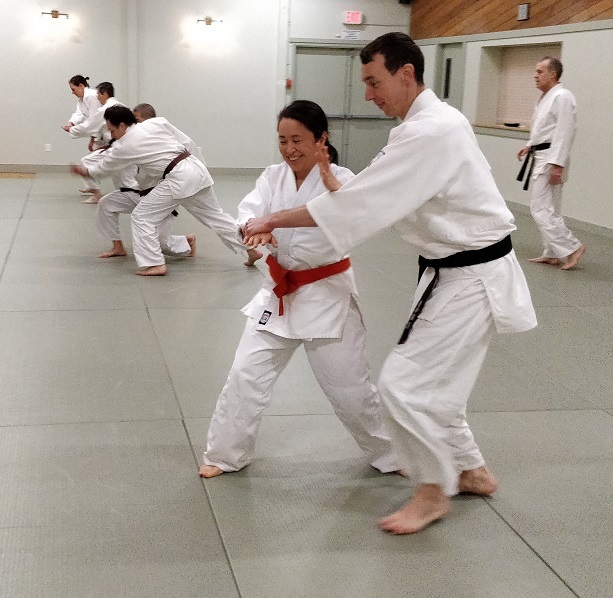 After lunch, Shioda Kanchou taught a number of basic controls and showed how they should be applied using small - but powerful - movements focussed through the kamae stance. 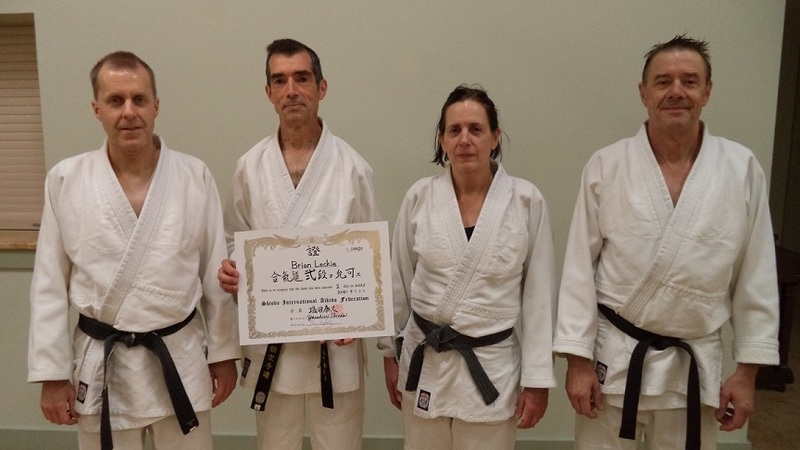 Shioda Kanchou presented a number of dan certificates: Wendy Seward (3rd dan), Jim Kightley (4th dan), Jim Stewart (7th dan), and Fred Haynes (7th dan). 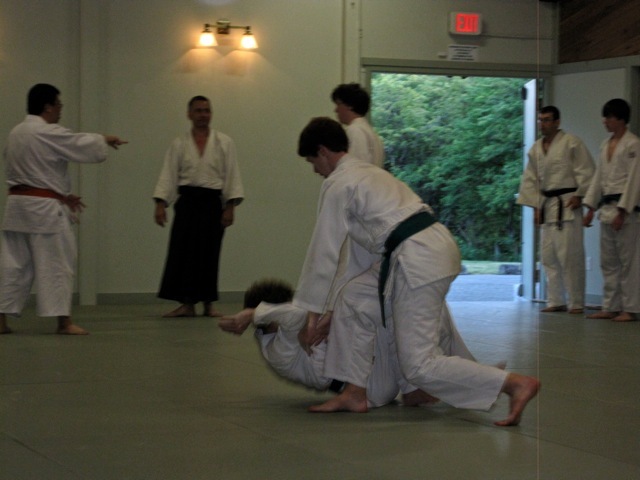 The last event was a demonstration by all participants. 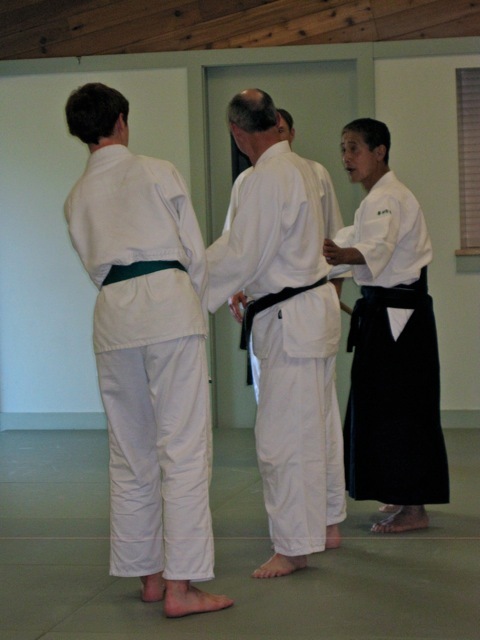 The highlight was, of course, Shioda Kanchou's demonstration with Graham Stewart. 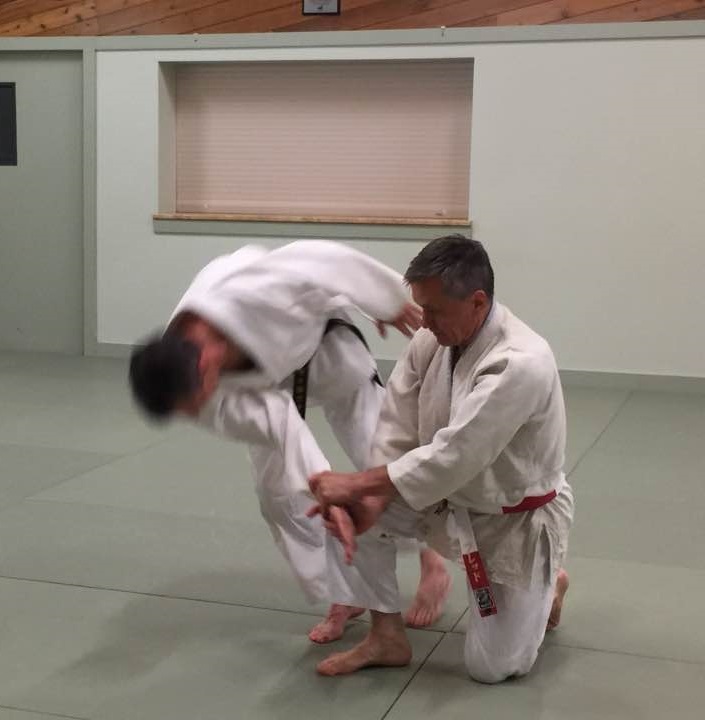 Shioda Kanchou's movements appeared swift and fierce, as well as powerful, but Graham reported no ill effects - true aikido training! spent the evening relaxing and socializing at Fred Haynes' home. 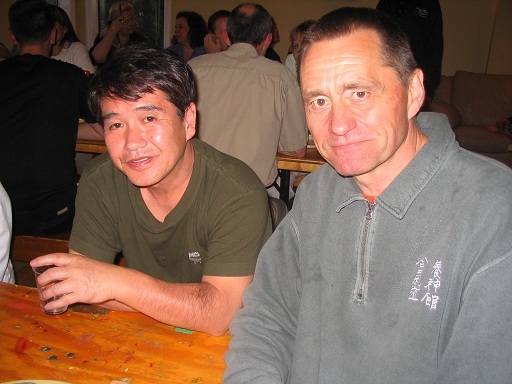 Brave persons were offered the chance to go tubing on Prospect Lake (a wild ride on an inner tube towed behind a motor boat), but most stayed indoors to enjoy curry rice prepared by our Japanese visitors and many other treats brought by all to share. 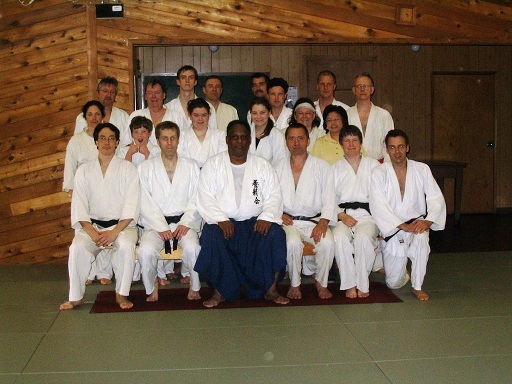 We were delighted to welcome an old friend, Amos Parker (8th dan) from Houston, Texas. 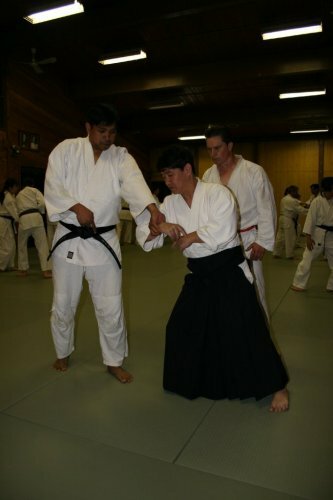 He is a direct student of Terada Sensei (9th dan). 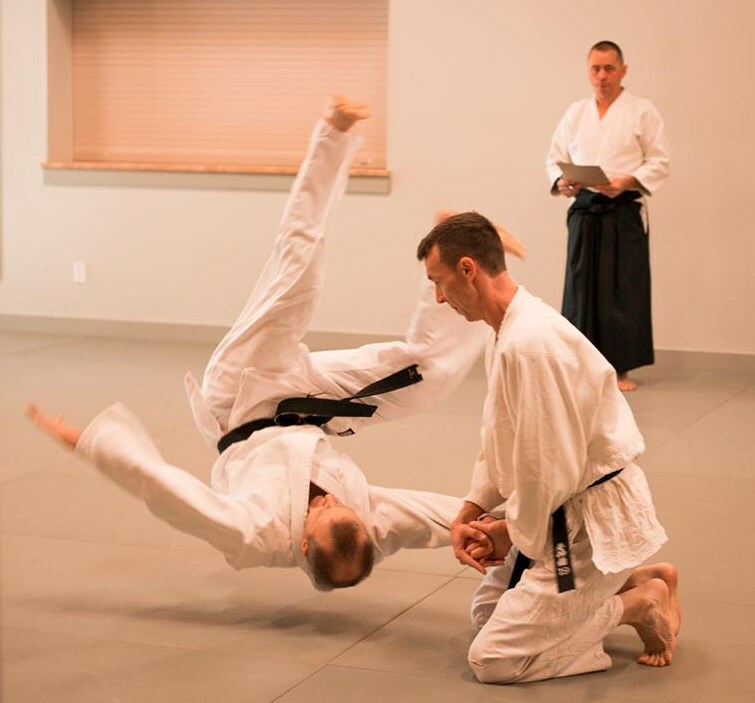 Parker Sensei taught a class focussed on advanced technique forms. 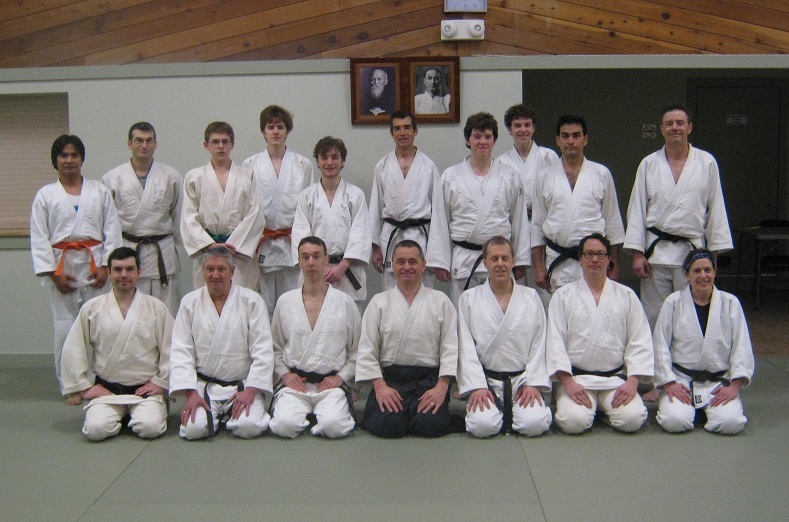 He visited Victoria during a week of clinics at the group of Vancouver Aikido clubs. 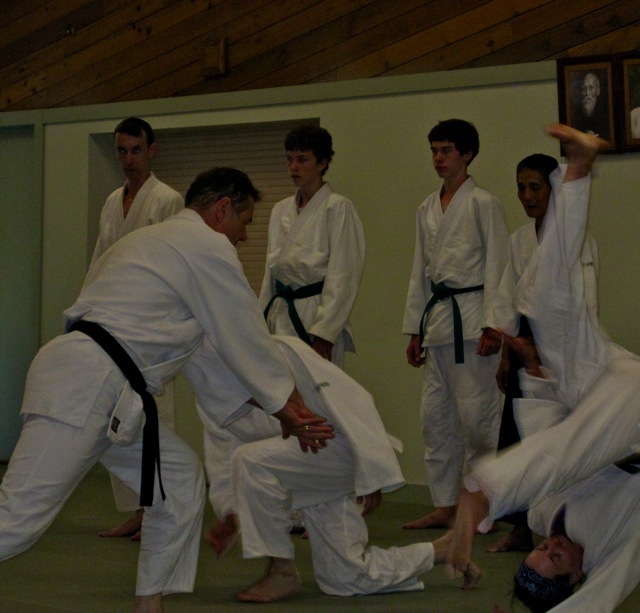 © Island Aikido, Victoria BC Canada. All Rights Reserved.